Rediff.com » Getahead » #GadgetWatch: Is the GoPro Fusion worth Rs 57,000? 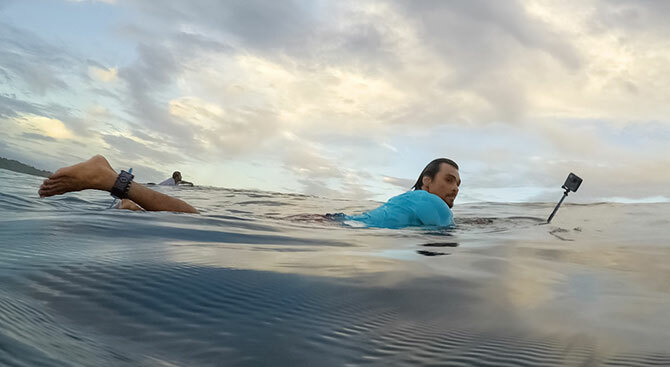 The GoPro Fusion is a 360-degree, still recording device, which also has the capabilities of the action cameras synonymous with its American maker. This is a new segment from GoPro. But, for such a device, its utility is more important than its brand. People acquainted with GoPro's design philosophy will find the GoPro Fusion bulky. 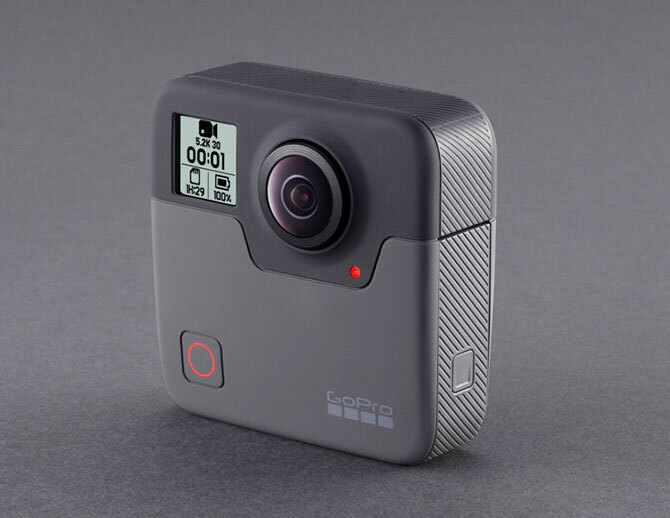 Instead of a compact, rectangular unit like the GoPro Hero 6, the GoPro Fusion is square. Although its size and weight are standard for a 360-degree camera, one would expect its fusion with an action camera to be a little more handy. Thankfully, its rubberised outer covering gives the camera a good grip. It sports two spherical, 18-megapixel wide-angle fisheye camera lenses on the back and front that protrude just a little too much, making them vulnerable to scratches. Its quality fabric case, however, keeps the camera safe when not in use. The front also features a small, backlit monochrome display and a tiny LED indicator, along with a recording button that doubles up as a selection key for camera settings. On the back, the camera has a microphone for audio recording and three more on top of the device for stereo audio. A metallic bracket at the bottom allows the camera to be mounted on GoPro accessories such as a tripod or a stick. The camera has no internal storage. To record a 360-degree video or capture a still with a 360-degree view, the camera uses both 18MP lenses simultaneously and saves the information from each lens in a separate microSD card (it has two slots for this very purpose). The camera can record in 5.2K resolution at 30FPS (frames per second) and 3K videos at 60FPS. The output in both is excellent in daylight conditions. There is some noise and loss of detail in low light, but the overall output remains fairly good. But this is where the fusion gets interesting. The OverCapture feature allows one to pull out any part of the stored 360-degree footage and convert it into a regular video (HD and fullHD), which is very useful when uploading to platforms that do not support 360-degree videos. The battery lasts a maximum of one hour while recording in 5.2K and an extra 10 minutes when recording in 3K. It's helpful that the camera turns off automatically if it remains idle for too long, which prolongs the battery life during mixed usage. 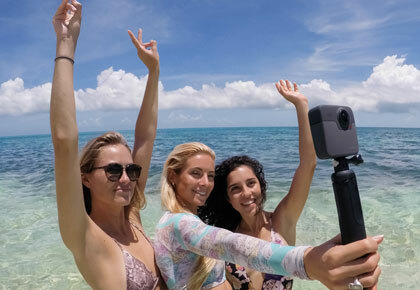 The GoPro Fusion is a remarkable camera let down by its limited compatibility with mobile devices and an unpolished software suit for post-processing, which reduces the camera's overall utility. The Fusion Studio suite for the desktop hangs at random junctures and is slow to import, stitch in the 360-degree frame, render and then export the videos. 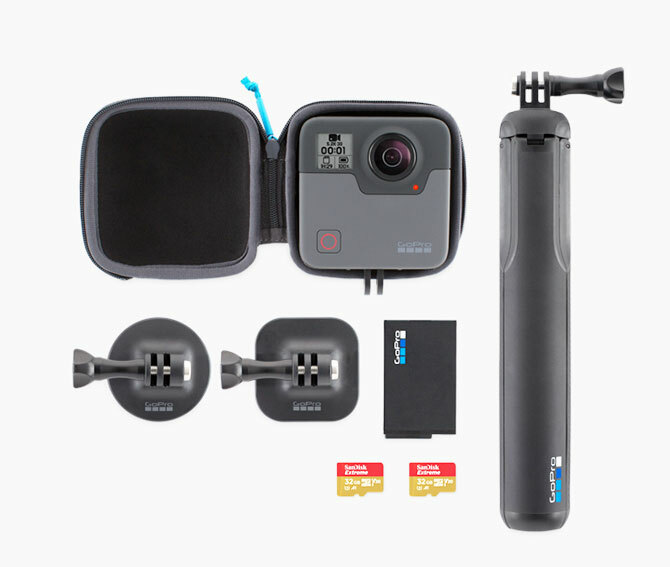 Priced at Rs 57,000, the GoPro Fusion's smooth design, capable camera lenses, waterproof capabilities and bundled accessories are best suited for content creators with a penchant for adventure genres. But post-processing will be a hassle. Would you choose phone camera over DSLR?